The National Cherry Blossom Festival Parade. Photo courtesy National Cherry Blossom Festival. Spring is in the air—and more important, in the trees. The National Cherry Blossom Festival kicks off Wednesday, March 20 and celebrates Washington’s favorite florals through April 14. Peak bloom is expected to be between April 3rd and 6th, but you can make the most of the weeks-long festival season with parties, street fairs, blossom bars, and more. The digital, interactive art museum is taking an existential approach to cherry blossom season, ruminating on the “fragile beauty and ephemeral nature of the cherry blossom.” Explore the floral galleries designed by five female artists. After, head to the museum bar for augmented reality cherry blossom cocktails. Details: Now through May 21; $20 per person; $10 for children age two to 14. Take a break from all things cherry flavored at Estadio’s annual Sherry Blossom Festival, which celebrates the Spanish fortified wine. The kick-off party is Wednesday, March 20 with sherry flights, sherry-themed dishes, and complimentary porron pitchers that’ll travel around the restaurant (going forward, Mondays will be “pass the porron” nights with gratis sips). Look for more sherry-fueled events through mid-April, such as a sherry class on Saturday, March 23. Details: March 20th to April 14th. Prices vary. The wedding-themed bar on 14th Street pays homage to Osaka’s nightlife district, Dotonbori, for cherry blossom season. Drink cocktails infused with Japanese ingredients under glowing lanterns, cherry blossom branches, and ramen shop signs. Details: Now through April 20. Admission is free. 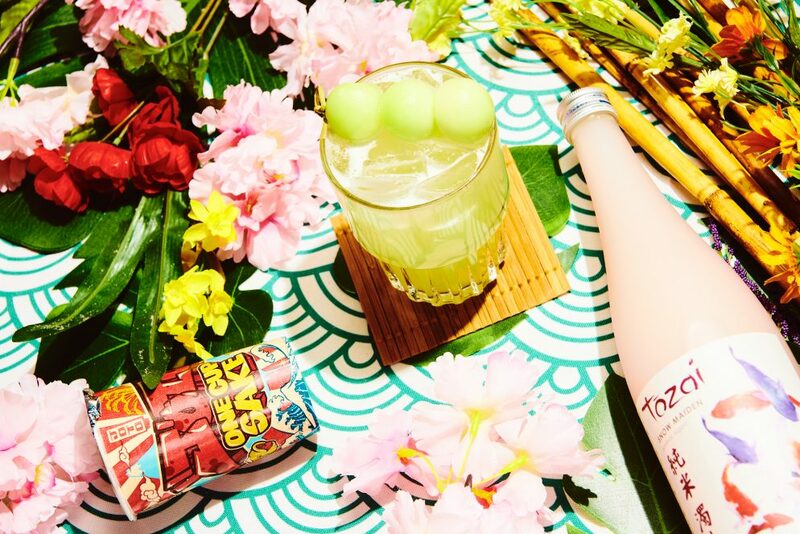 Drink Company’s spring-themed pop up bar is back for a third year with hundreds of blossoms and a ramen room where you can eat the noodle soups amidst a ramen installation. Details: Now through April 21. Admission is free. Sip cocktails and eat ramen at Drink Company’s cherry blossom pop up bar. Photograph by Nicholas Karlin. The annual festival gala brings together floral spring fashion, food from dozens of restaurants, cherry blossom cocktails, a silent auction, and more at the Ronald Reagan Building. Details: Friday, March 22 at 7 PM. Tickets start at $225 for general admission. Celebrate Japanese culture in the courtyard of the Smithsonian American Art Museum. Activities include learning tatebanko, the art of making paper dioramas, listening to taibo drumming, hunt for spring themed paintings, and more. Details: Saturday, March 23, 11 AM to 3PM. Free. Based on a beloved Japanese comic series, “Pretty Guardian Sailor Moon” makes its North American debut in DC for the Cherry Blossom festival—and promises to be much more than just a musical. Experience 80 minutes of speed, dance, and visual effects based on the best-selling manga about an ordinary girl who goes on a quest to find a magical artifact. Details: Warner Theater on Sunday, March 24, at 8:20 PM. Tickets start at $62. Spring takes flight a the annual event, where thousands of kites take to the sky on the National Mall. Watch professionals demonstrate tricks and compete for kiting glory. Kites are available for purchase or you can BYOK. Details: March 30 from 10 AM to 4:30 PM. Free. The kite festival on the National Mall. 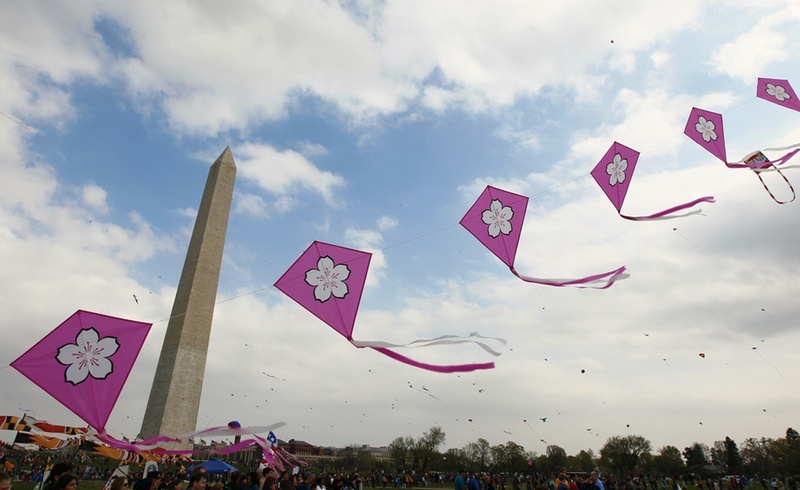 Photo courtesy National Cherry Blossom Festival. Throw on a cherry blossom flower crown and head to Petalpalooza for a day of beer gardens and live music by the waterfront. Once the sun sets, a fireworks display will explode over the Potomac River at 8:30 PM. Details: Saturday,April 6 from 12 PM to 9:30 PM. Free. The Mosaic District’s Strawberry Park is transforming into a cherry blossom park with interactive art installations and a beer garden. Pick up vintage and handmade trinkets from the gift fair for a souvenir of this year’s blossoms. Details: Sunday, April 7 from 11 AM to 5 PM. Free. If you need to get around Washington during the festival—do it in style. Potomac Riverboat Company’s water taxi offers a scenic ride with a drop-off near the Tidal Basin’s cherry blossoms. Alternatively book one of the river cruises that departs from Georgetown, the Wharf, and Alexandrian. Details: Times and prices vary. Bring your pup to Milk Bar Logan Circle for an afternoon of dog-friendly fun and food and drinks for people. In addition to the puppy happy hour, the bakery’s Cherry Rose cookie will return to DC-area stores just for the National Cherry Blossom Festival. Details: Thursday, April 4 from 5 PM to 8 PM. Free event; cookies $2.75 each. 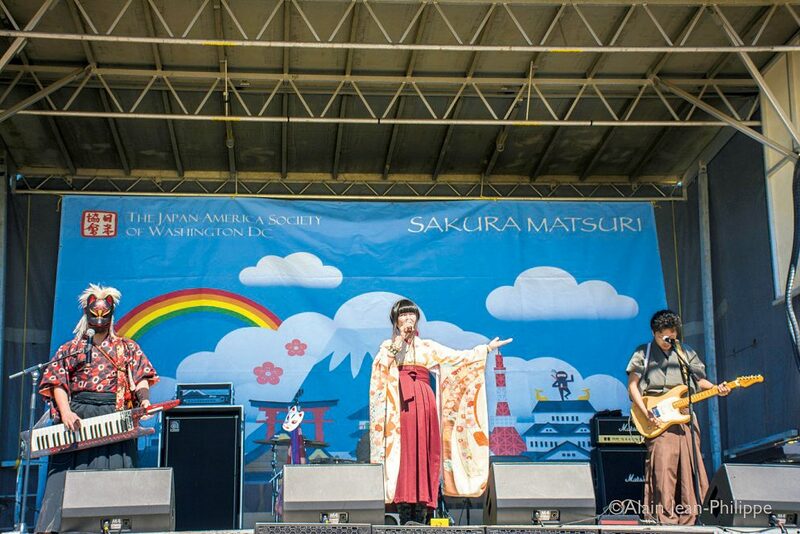 The 59th annual festival bills itself as the largest one-day celebration of Japanese culture in the United States. There’s something for everyone: 30 hours of live music and dance performances, a J-Pop stage, Ginza marketplace for shopping, over 25 restaurants and Japanese food vendors, sake tastings, a Kirin beer tent, and much more. Details: Saturday, April 13 from 10:30 AM to 6 PM; tickets are $10 (general admission) to $50 (with sake tastings), and free for kids under 13. The annual parade takes over Constitution Avenue with a series of dance performances, live music, balloon floats, and performances by Motown star Freda Payne and others. The parade is free, though tickets start at $20 for grandstand seating. Details: Saturday, April 13 from 10 AM to noon.